Mountain towns seem to have a common feel wherever they are. It's the sense of being away from things at the end of the road, and not on the way to anywhere else. This late in the season the little towns are quite empty, and cold at the end of the day - you can feel the seasons changing. I wanted to come to Bubion and stay at the Hostal las Terrazas because Christine and I stayed there about 15 years ago. It wasn't exactly how we remembered it but even nicer and had great views. The weather is still excellent but starting feel unsettled, so we had clear blue sky the first half of the day but cloud in the afternoon - it is threatening to rain and indeed the forecast is not so good for the day after tomorrow. Perhaps the best view of the day was the early morning view, following the climb up over the pass to the east of Bubion, looking up the Poqueria valley to the top of Velata (3394m). 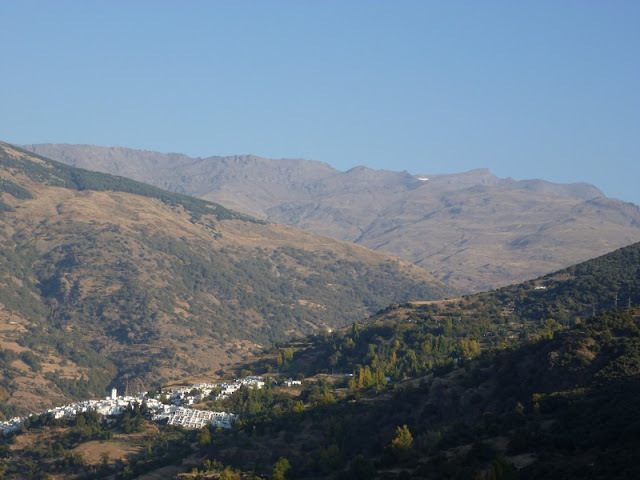 After this first climb the path went down and through, in rapid succession, a series of traditional immaculately kept white villages - Capilerilla, Pitres, Atalbeitar, Portugas and Busquistar. 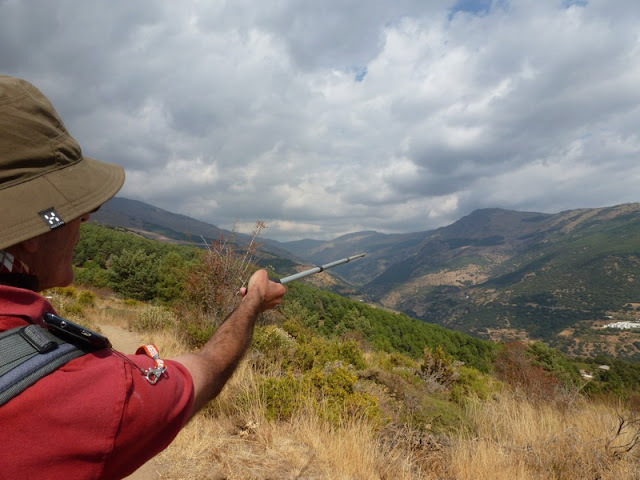 With navigation now in Juan's super- capable hands, Christine and I were not paying that much attention to the big unresolved navigational issue, could we get through to Trevelez without a long walk along the road? 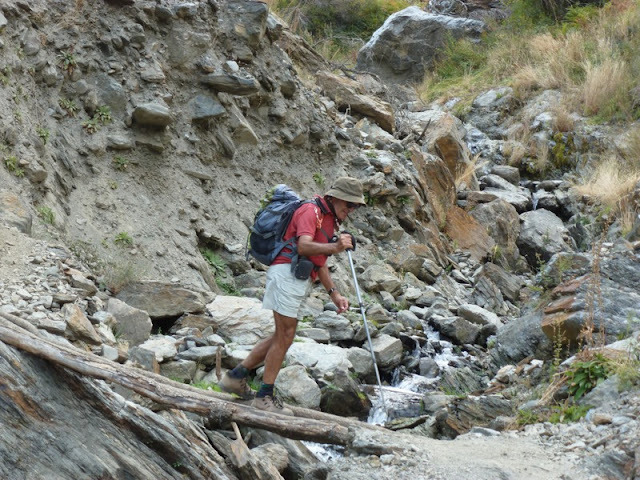 Juan had heard that a land slip had destroyed the original path but was not sure whether an alternative had been constructed. Of course asking locals whether a long walk through the countryside was intact or not does not always produce a sensible answer, and people who live and work in the countryside seem to think that people who walk for pleasure are mad. After asking the question to a dozen or so people, two answers which seemed for once to accord with each other gave us confidence and we pressed on. At Portugas we stopped for lunch (fruit juice and salami) sitting around an 'outdoor fitness centre' which every village around here seems to have (sponsored by a local bank). 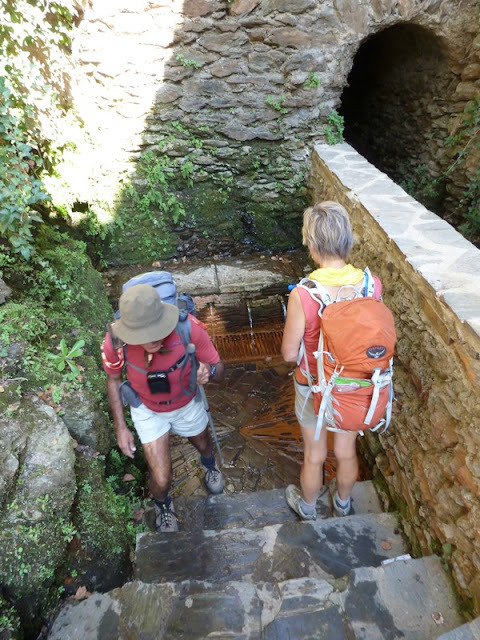 Then we walked down the hill to the Agua Agria de Portugas, a famous mineral water spa. Coach loads of tourists were stopping to sample the orange tinted water which is supposed to be healthy, it tasted disgusting, like drinking rusty nails. When it comes to health giving qualities I'm a rusty nail water drinking sceptic. After the white villages we set off on the final 10 kilometre stretch up the valley to Travelez. The clouds were beginning to gather but the views were wonderful. These mountains are not Alpine despite rising to well over 3,000 metres. If anything they resemble the Pennine moors but on an absolutely massive scale. Eventually we found out what the landslip had done to the route - a new 300 metre drop into a gorge to by pass it, and the inevitable 300 metre climb out the other side. At the bottom of the gorge there was an interesting little footbridge which everyone crossed safely, despite the attention of the cameras. Arrived at Trevelez just after 5. Lovely old town and the hotel we are staying in, the Hotel la Fragua, is excellent, nice room with views down the valley. Trevelez has a claim to be the highest town in Spain and is famous for its 'jamon' which, no doubt, we will be sampling later on this evening. COPYRIGHT (C) 2016 John Hayes E4 Long Distance Walker ALL RIGHTS RESERVED. Ethereal theme. Powered by Blogger.